CESNUR Library is pleased to announce that it has acquired through an E-Bay auction one of the rarest pulp magazines, Astounding Science Fiction, vol. XLV, no. 3, May 1950. Although L. Ron Hubbard had privately published The Original Thesis in 1948, and further expounded his first ideas about Dianetics in the Explorers Club Journal, these were not publications on sale to the general public. The article “Dianetics: The Evolution of a Science”, pp. 43-87 of Astounding Science Fiction, vol. XLV, no. 3, was the first introduction of Dianetics to a wider audience in an immensely popular magazine. The issue carried an unusual note by editor John W. Campbell, Jr. “Concerning Dianetics” (pp. 4-5), where Campbell enthusiastically endorsed Hubbard’s theories, and Hubbard’s text itself was introduced by Dr Joseph A. Winter, MD. Campbell and Winter were at that time joining the newly founded Hubbard Dianetic Research Foundation. They abandoned the Foundation after their attempt to prevent the investigation of past lives was stopped by a majority vote in the Foundation’s Board of Directors in July 1951. In fact, what Winter and Campbell were resisting was the transformation of Dianetics into a full-blown religion, Scientology. 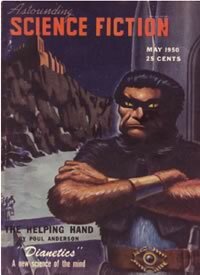 The May 1950 issue of Astounding Science Fiction remains, at any rate, of exceptional importance for the history of the early period of Dianetics and Scientology.